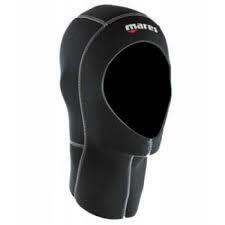 The Mares Flexa Hood 6.4.3 is a great allrounder hood that can be worn for scuba diving, snorkelling or spearfishing. It is made from a 6.4.3mm neoprene which will supply warmth in the cooler seasons, yet wont be too constricting for those who want to wear it for sun and stinger protection. There is a smooth skin face seal around the edges of the face for extra comfort and warmth. The small vents on the top of the hood allow any trapped air to escape. Available in 4 sizes, Small - X-Large.